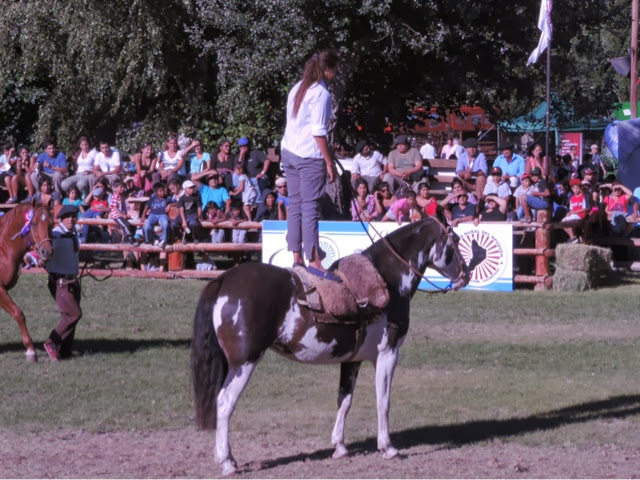 La Rural is another term for a fair where people display their livestock as well as compete. The few days that we were there we did see some cutting competition and horse auction. 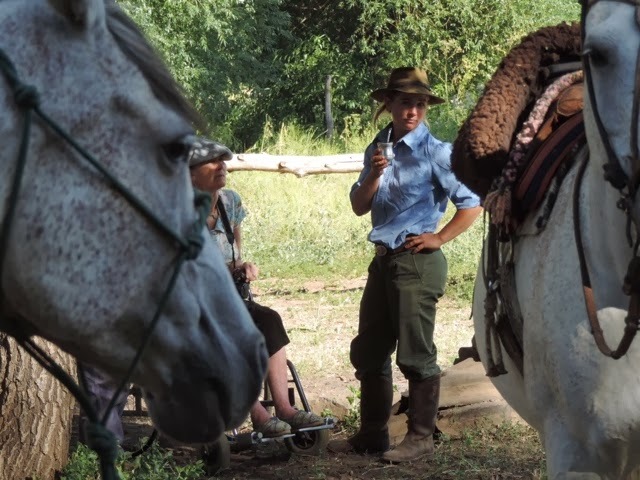 The horses were beautiful and so well trained. Not expensive by North American standards. 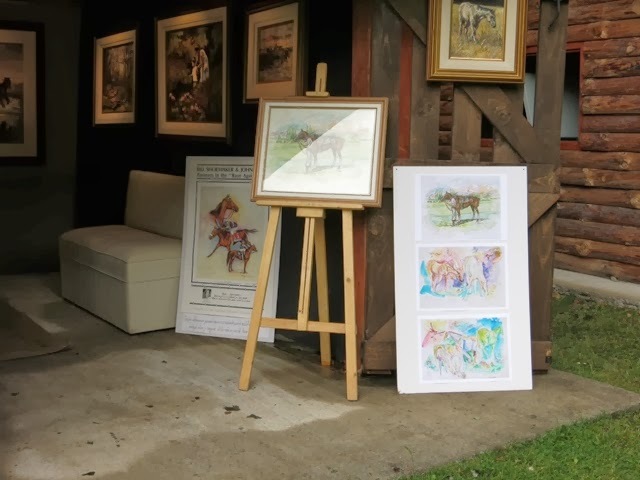 There were stalls set up selling saddles, bridles, halters, clothing, food...you name it! 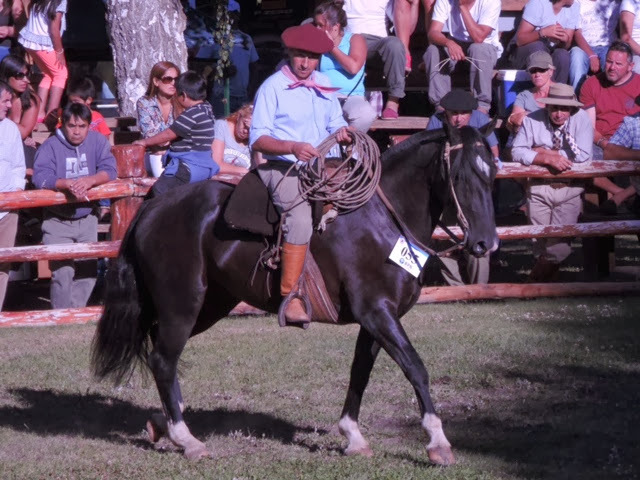 Oh how I would have loved to buy a horse and an Argentine saddle. (Wouldn't that be a great souvenir!). They look so comfortable. 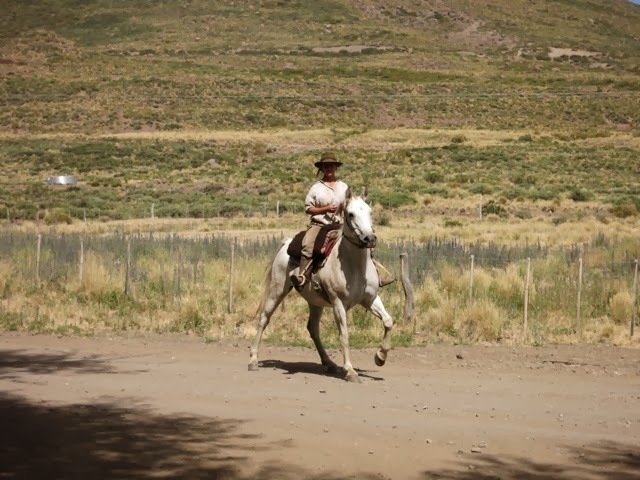 Perhaps that is why there are so many more men riding in Argentina as compared to North America. 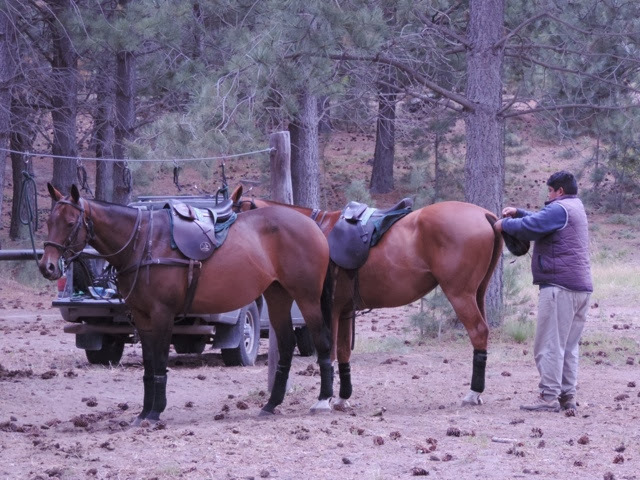 Owners show off how well trained their horses are. 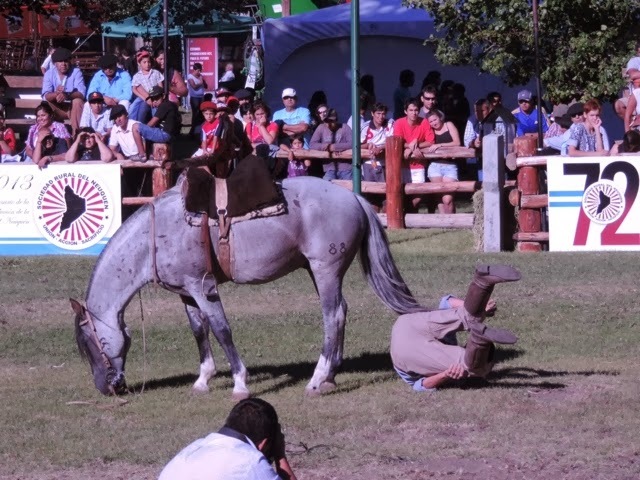 This fellow just did a somersault under his horse. 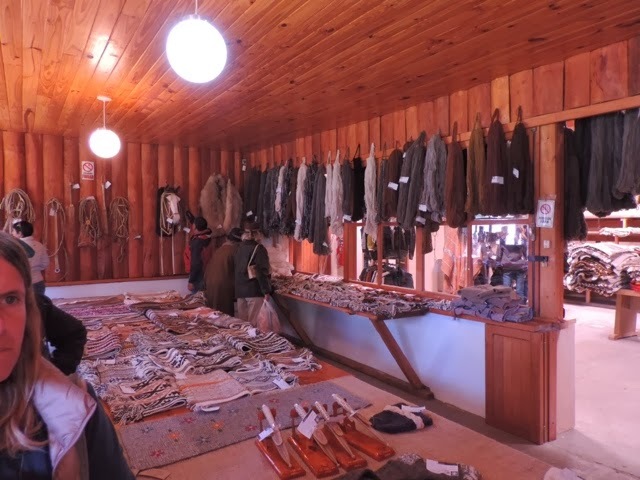 The traditional outfit for the men is proudly worn. Men and women had wonderful clothes for this event. 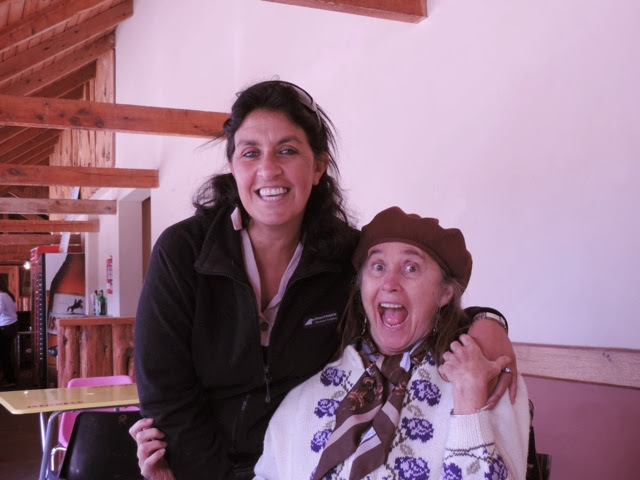 We headed home on Monday after a week in Junin de Los Andes but stopped in Zapala for the night as the entire journey is too long for Ginny. She also had some business to conduct in Zapala but unfortunately everything was closed on Tuesday morning when we were ready to head out. The weather is hot again and the trip home was uneventful. 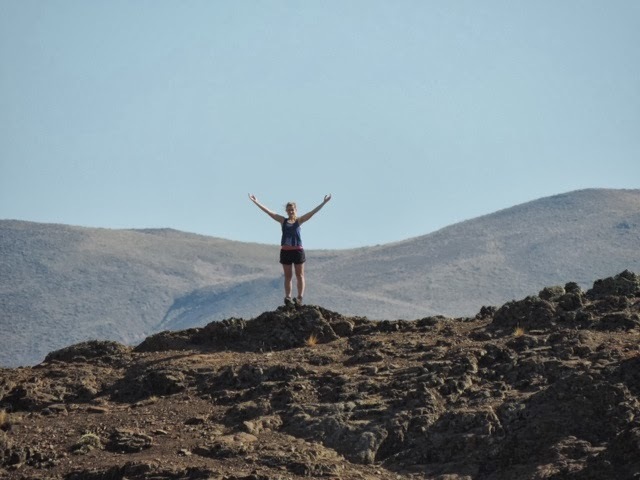 The last 80 kms or so is unpaved gravel so not the most fun at the end of the trip. Glad to be back at El Huecu. The weather here has been quite unbelievable. It's cold!!! We went from +30 and now there is snow on the surrounding mountains. It was raining until the afternoon when finally the sun tried to peek through. Still very cold (+5) but they are expecting it to get warm and nice for the weekend. Thank Heaven as I am not prepared for this cold weather. 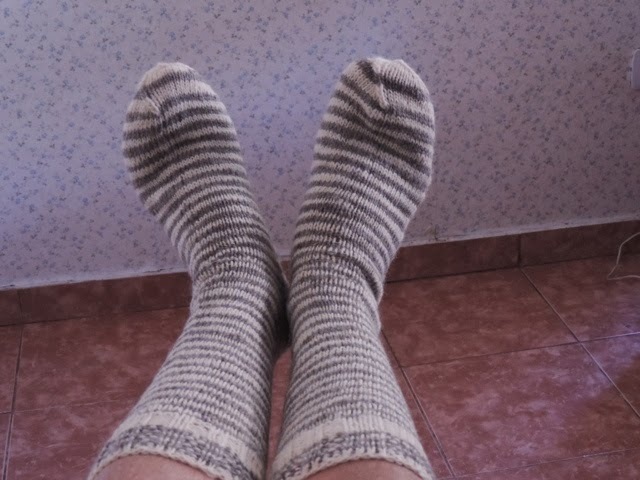 Bought myself a lovely pair of hand knit socks at the fair today. I feel like a munchkin off the Wizard of Oz when I wear them but they keep my feet toasty. Things are just getting busy as they are setting up most of the booths. We dropped Ginny's artwork off to be displayed and then walked around and checked things out. Ginny knows quite a few people. 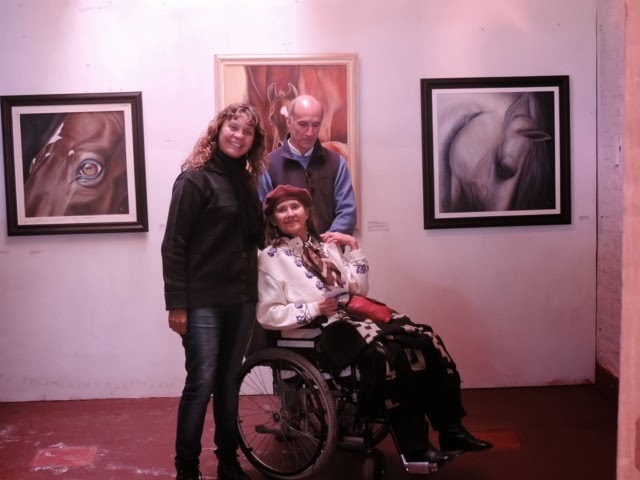 Here she is with a fellow artist who is displaying some of her work. Cedar is camping out with Jorge tonight at the fair. Should be fun but cold. Will be back first thing in the morning so that the two of us can tend to Ginny's toilet. 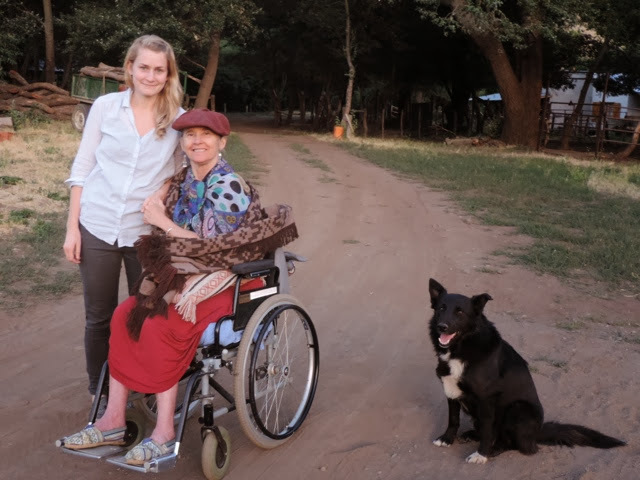 It takes two people now as Ginny is experiencing weakness in her one good leg. Hopefully stem cell procedure will improve her condition. Possibly scheduled for February/March. The weather has changed! We've gone from +30 to 7 degrees! I didn't pack for this cool weather. Trying to make use of a poncho however it doesn't look great with capris! It's due to warm up by the weekend. Back up to +30 but in the meantime the rain is very much needed. Here we are at a polo match. Gorgeous horses. Getting them ready for the next match. A friend of Ginny's, Tomas Gibelli, just finished his game. Unfortunately they lost this match but it was close. Tomas has ridden since he was a child. 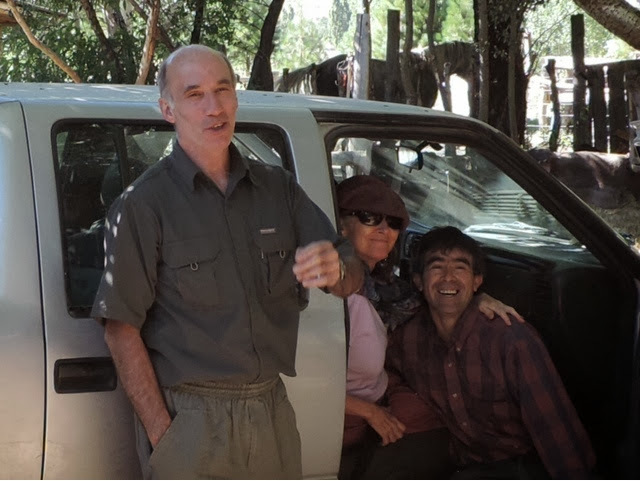 On Monday morning we loaded up the truck and Cedar, Jorge, Ginny and I headed off to Junin de Los Andes for the State Fair. It was quite a process as quite a few supplies were needed for Ginny's care. 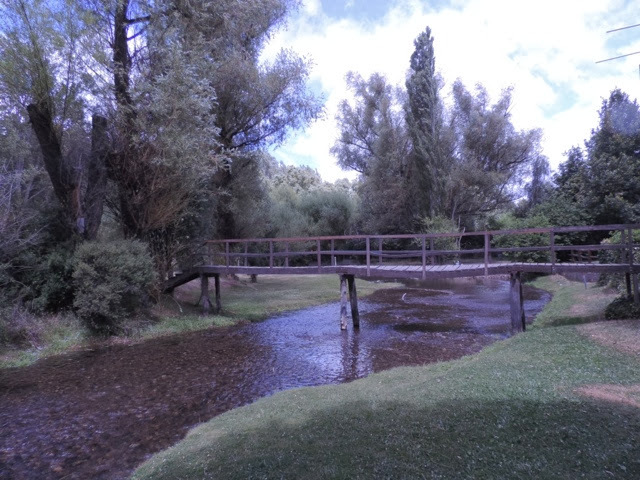 It took about 8 hours to drive there and along the way was some amazing scenery. 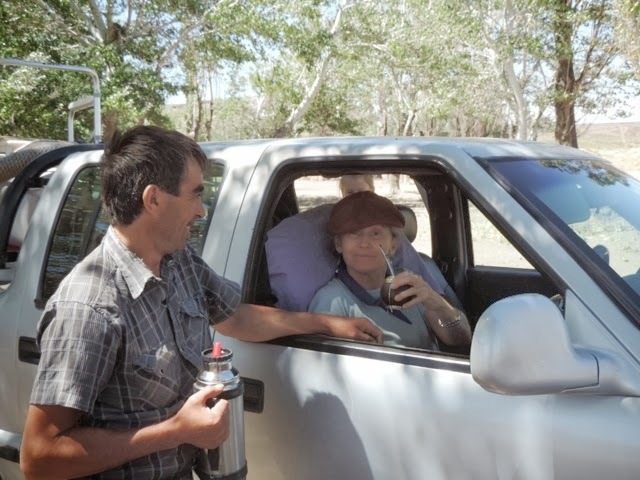 We stopped half way for a "tailgate lunch" and so that Ginny could rest and have Mate. 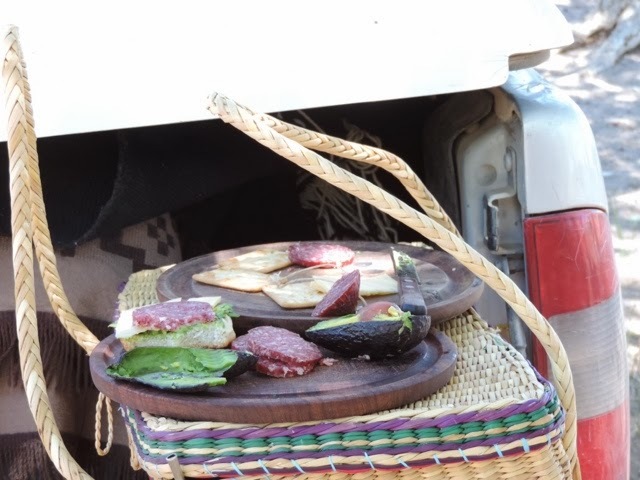 The old Patagonia winds were howling so the lunch was quick. 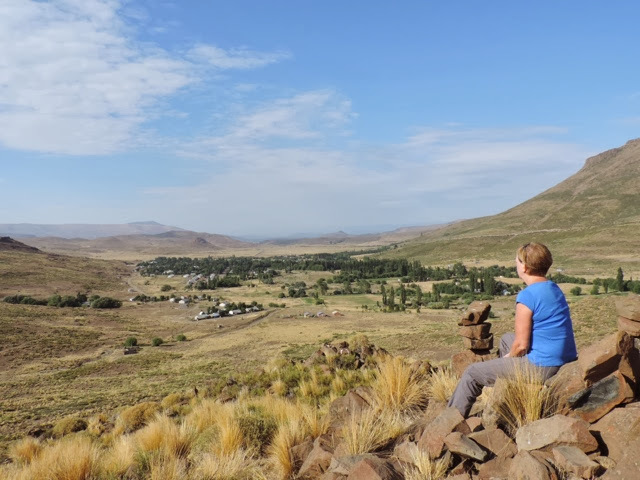 Once we arrived at Hosteria Chimehuin we settled in. 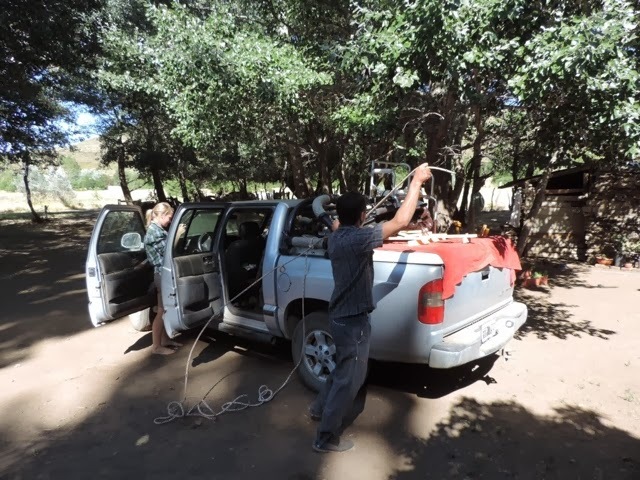 The next day, Jorge (senior) came from San Martin de Los Andes and joined us for lunch. 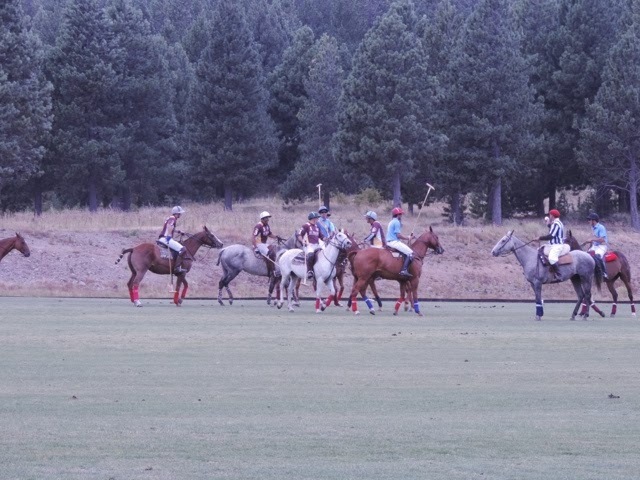 This afternoon we are headed to watch the Polo matches. 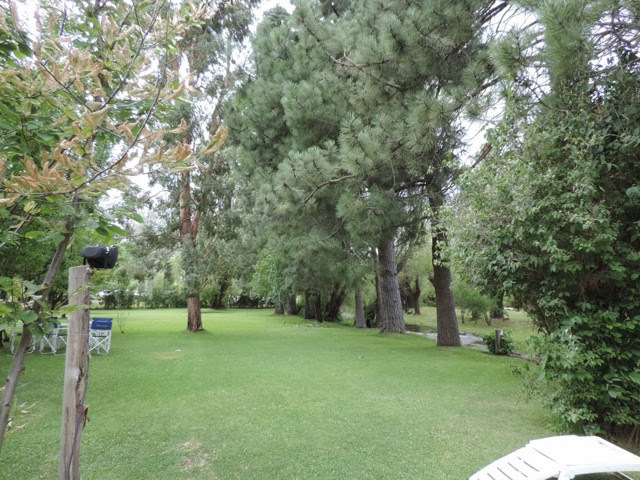 The property of the hotel is very pretty. 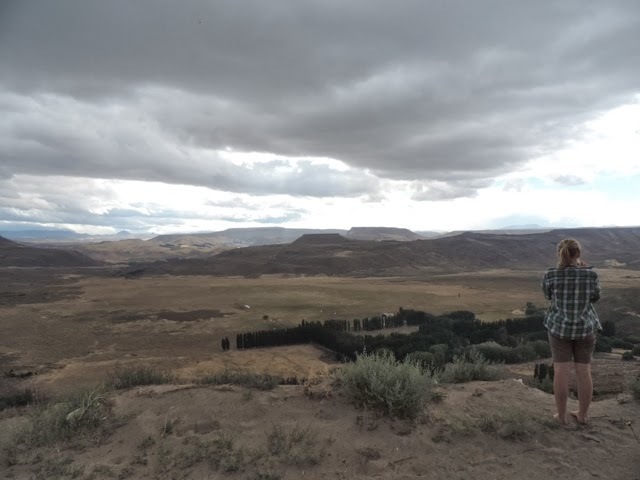 Cedar and I decided to do a little hiking in the hills behind the ranch. We set out around 8:30 to try and beat the heat but by the time we returned a couple of hours later it was hot. Great views and there was a nice breeze which was wonderful. There are some very prickly and sharp plants on our hike so I was glad I work my long pants. Cedar is only 22 and very fit. 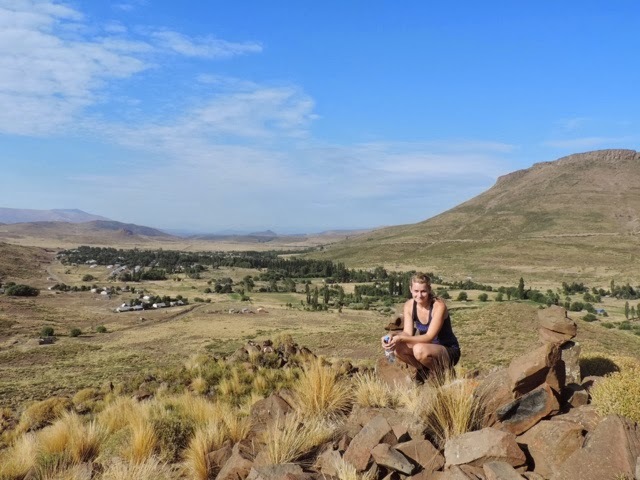 She does a fair bit of hiking so I don't think she even broke a sweat! After we reached the top of this hill I was done so Cedar went for a run to the next hill and along the ridge. 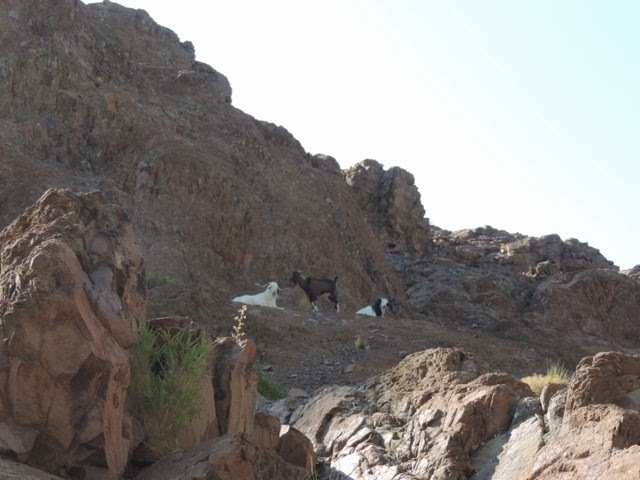 On the way down we discovered a group of goats. They seemed very at home in this environment. Jorge invited Cedar to his parents home for the main meal of the day. 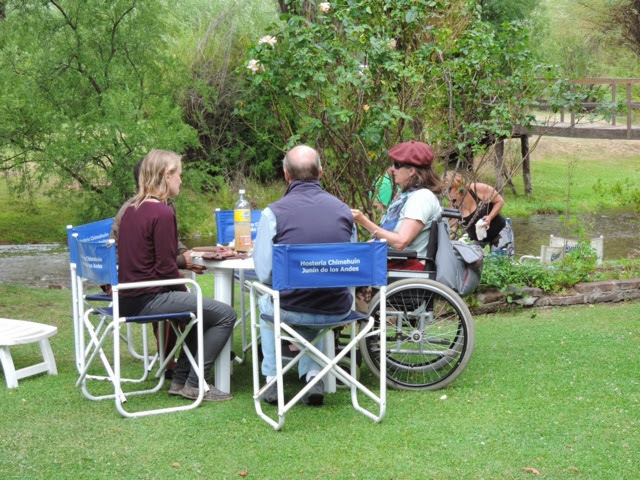 They were having a BBQ or as referred to in Argentina, an Asado. No horses on this trip.....just horsepower! Sky (Ginny's daughter) arrived for a couple of days. 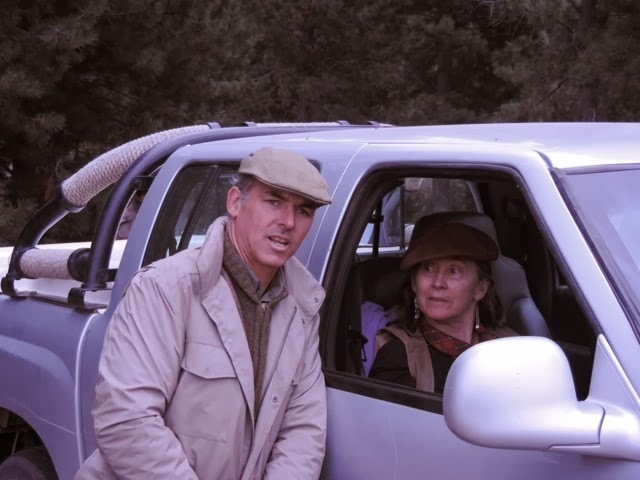 She and Jorge drove a few horses down to a paddock by Ginny's place where someone will be picking them up for the slaughter house. They are all around 30 years old and are no longer useful. Just an expense to keep fed. 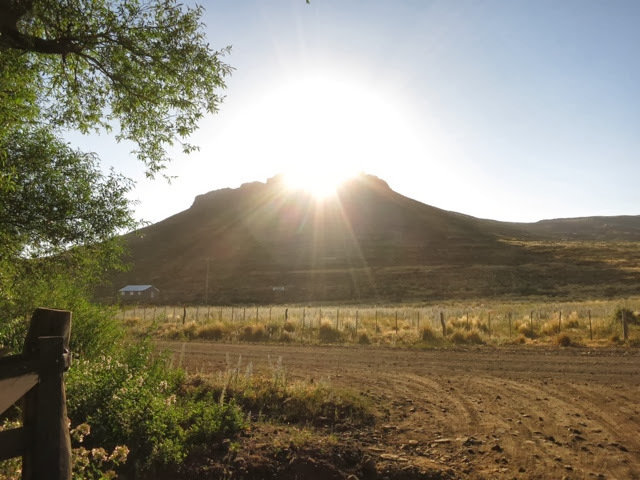 This is life on the ranch. So sad. I would have taken any of them home. They're beautiful! 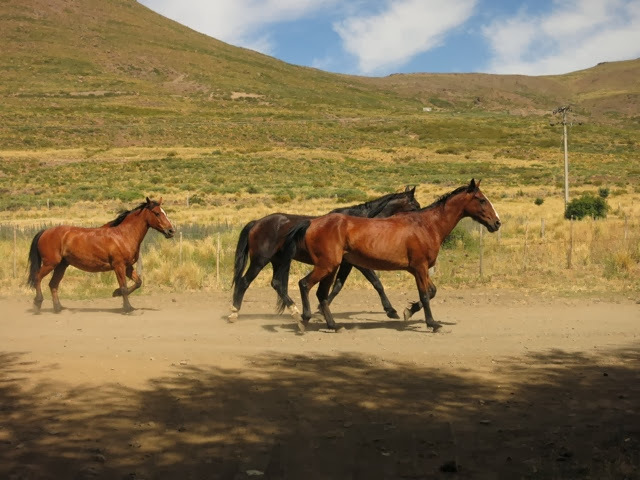 Sky driving the horses forward to the field they will stay in overnight. After two of the mares were bred to the stallion, Tornado, Sky takes one back with her to Buta Mallin. 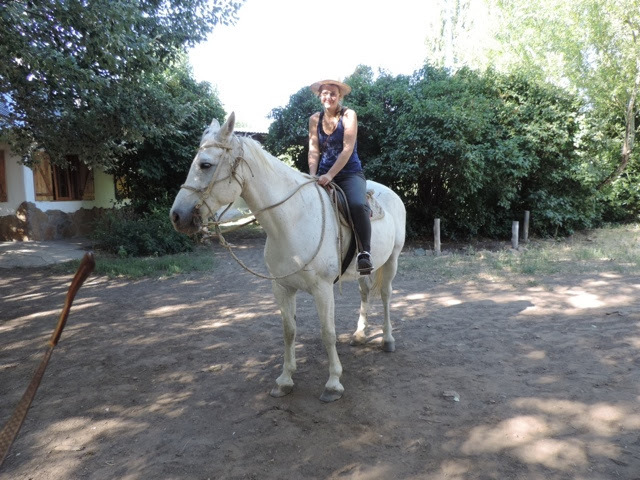 Sky is a real gaucho. 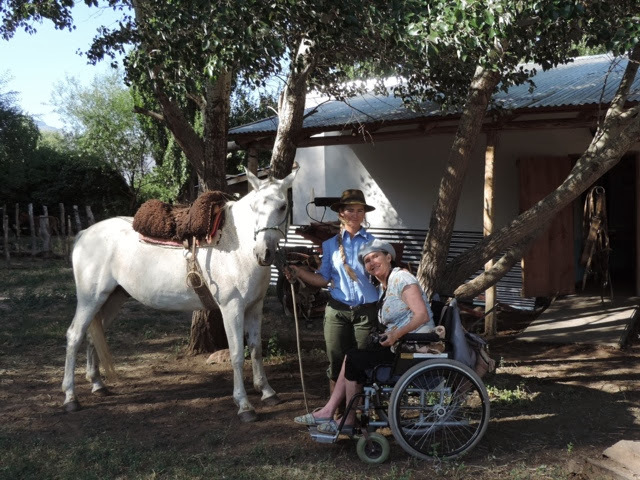 Perhaps if you are a woman and a gaucho it should be gaucha but either way she is amazing. One very strong, smart woman. Sky enjoying a Mate with her mom before mounting up. 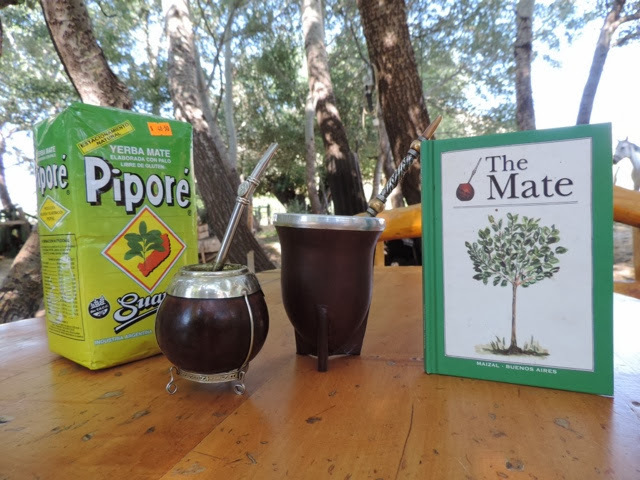 Mate is very much a part of everyone's day in Argentina. There is quite a ritual in the preparation and serving of Mate. It's a social thing. Time to relax and share the drink with conversation. You can add mint or a little sugar or whatever to alter the flavour. I didn't realize that when I passed on having Mate it was rude of me! It's difficult to keep up with the customs and cultures when you're travelling. 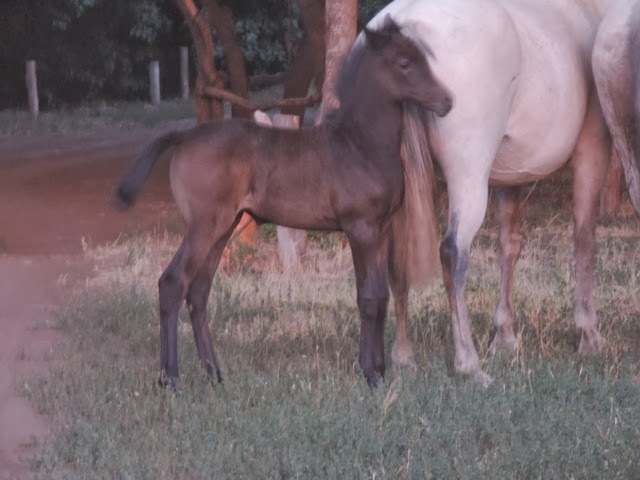 Another mare and foal have arrived. 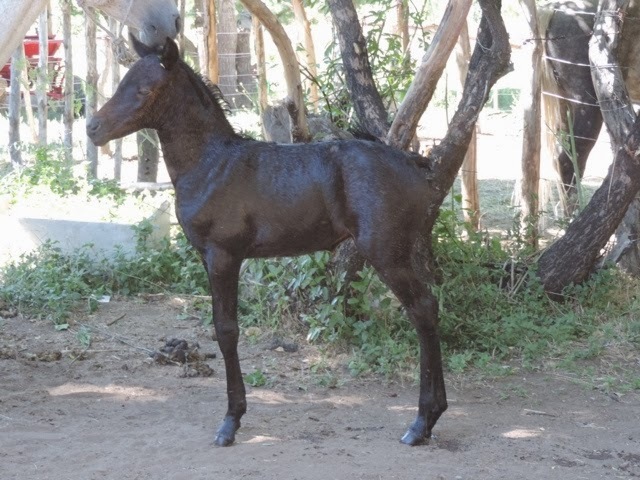 Mother foals are only a couple of weeks old. They are so sweet. Could it be that I mentioned to Ginny that there was mention of new born foals in her correspondence and yet when I got here there weren't any? Well all I had to do was ask! And the other baby posing for a picture. 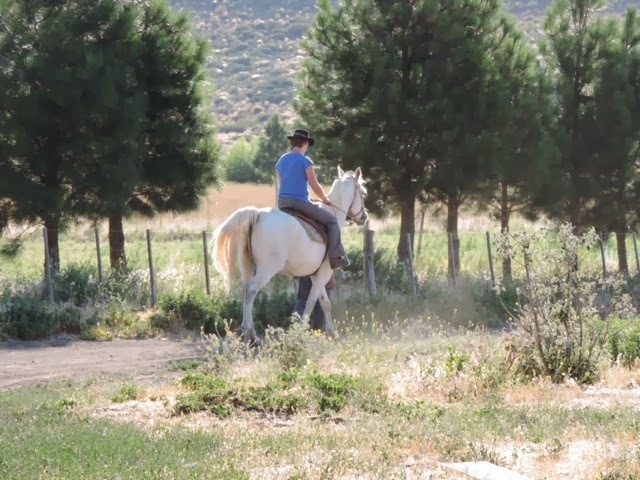 Here is Jorge's favourite mare. 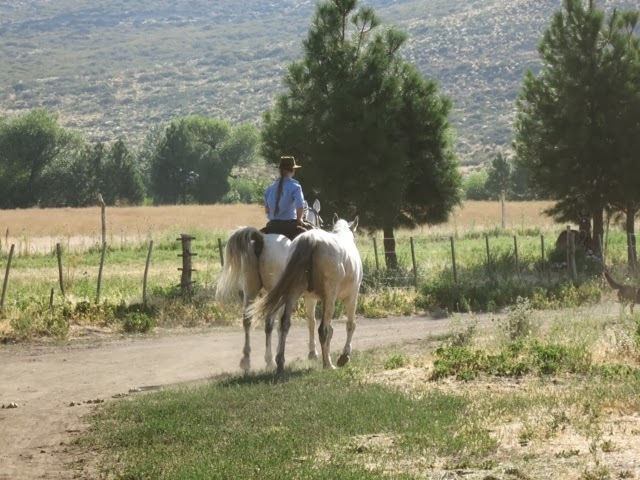 He and Cedar are heading out for a ride. They are going into town to pick up some groceries. 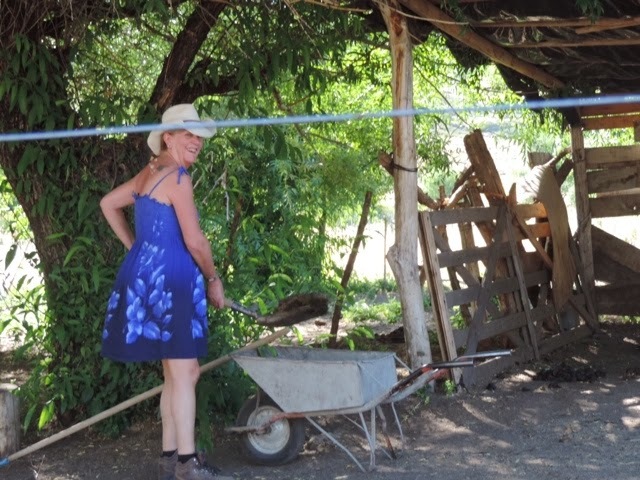 My turn is coming soon.....surely I have earned it from mucking out corals, feeding and watering the horses and planting the garden! However I am not 22 and beautiful! What can you do!!! Yesterday I picked up Cedar at the bus station in El Heucu. 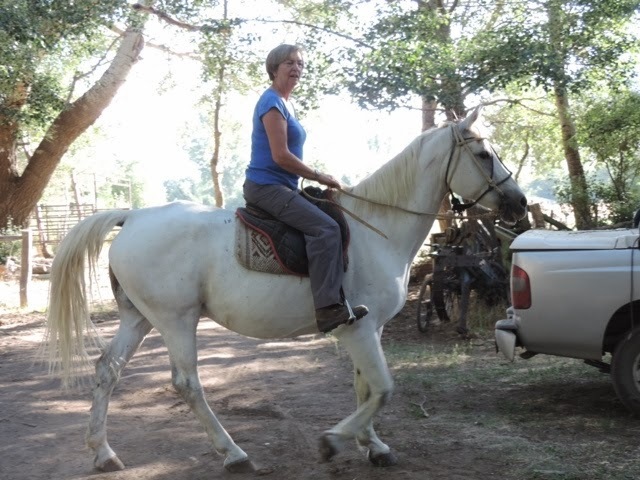 Cedar is one of the volunteers here at the Chacra and she has come from Victoria. Unlike me, Cedar speaks some Spanish which is so helpful. Her plan is to stay approx. 2 months. I am so pleased to have her company. 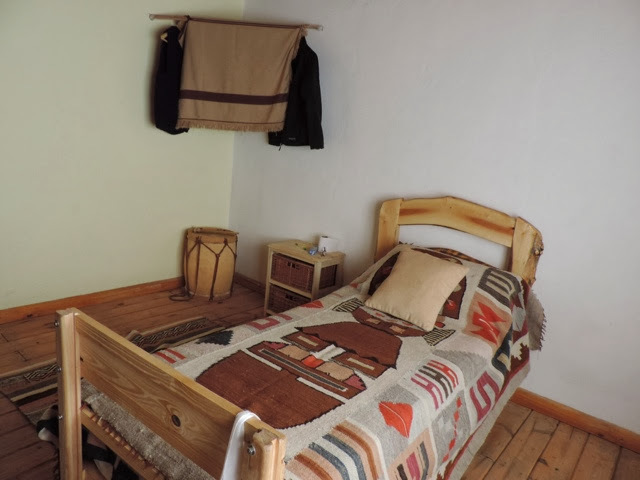 Now that Cedar will be sleeping in the main house I have moved to the ranch house which is separate. These are my new digs. 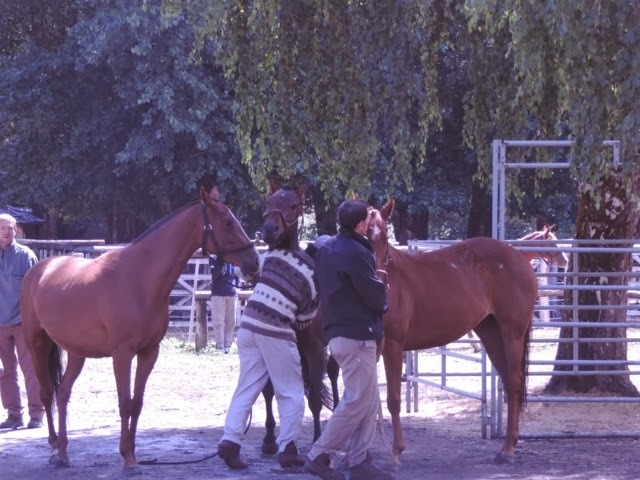 Also arriving yesterday to take up residency at the Chacra were three more horses. 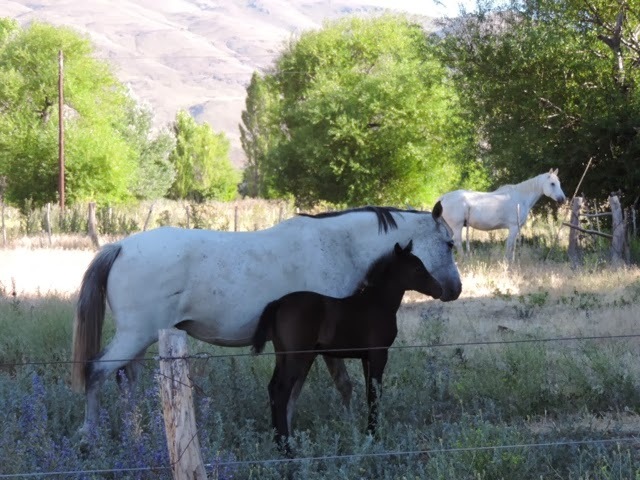 These consisted of two mares and a new foal. They were brought from Butta Mallin by Jorge and a friend. The foal is so sweet! Everyone is settling in just fine! 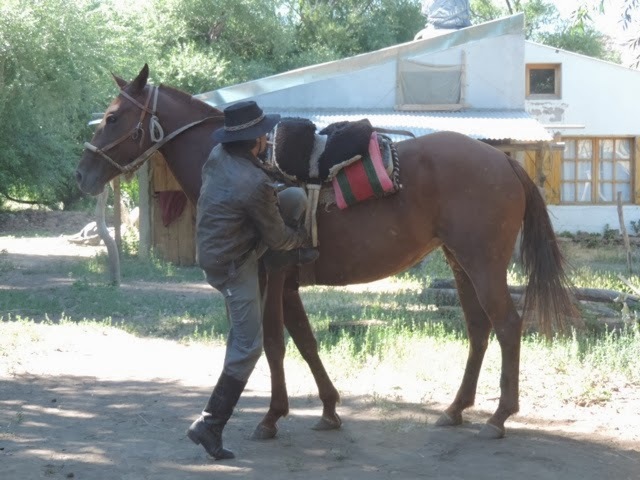 Well today Jorge set off on his horse to go to Buta Mallin for a few days to help Sky with all the work up there. They are terribly short handed so Jorge said he would help out. It would take him about 1-1/2 hours to ride there. 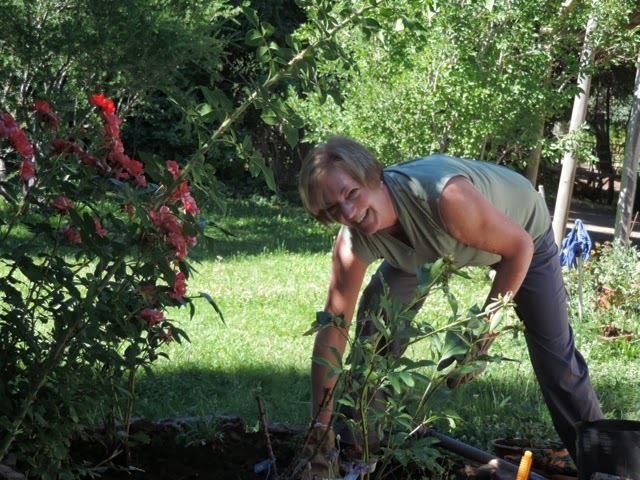 So then I decided to get busy in the garden before it got too hot. Ginny has been wanting to get some plants in the garden before they died so I accomplished that. 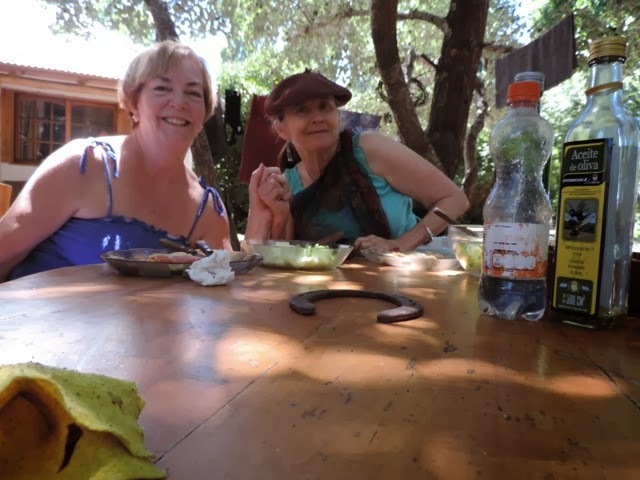 Next Ginny and I enjoyed a leisurely lunch in the shade. Then I finished up the day with mucking out the paddock. Note the nifty outfit! Cool and comfy but I've got my safety boots on! Last night a friend of Jorge's dropped by for a visit. 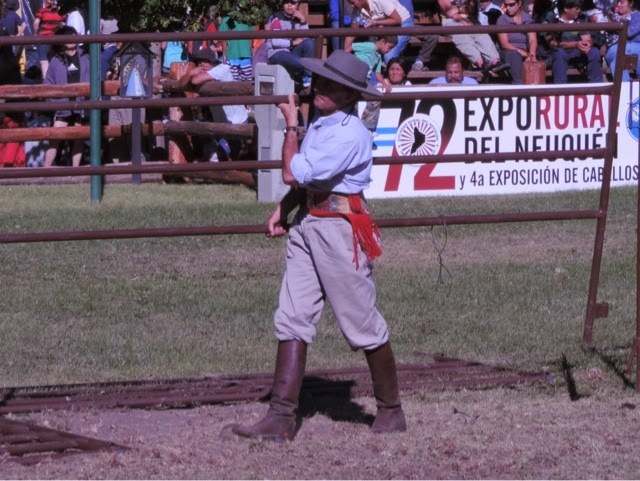 This man is a real Gaucho and dressed the part. Very nice. Jorge asked me to make a beer run and I wasn't sure where I was going as Jorge explained to me in Spanish. 'Just go down the driveway to the end, turn left on the road and walk a bit. There is a house on the right. Not that one but the next one. He will sell you beer. And here are two empty bottles to take with you". Now keep in mind this is my interpretation of what he is saying with many hand gestures. It is almost dusk and I have never noticed a store so am a little wary. 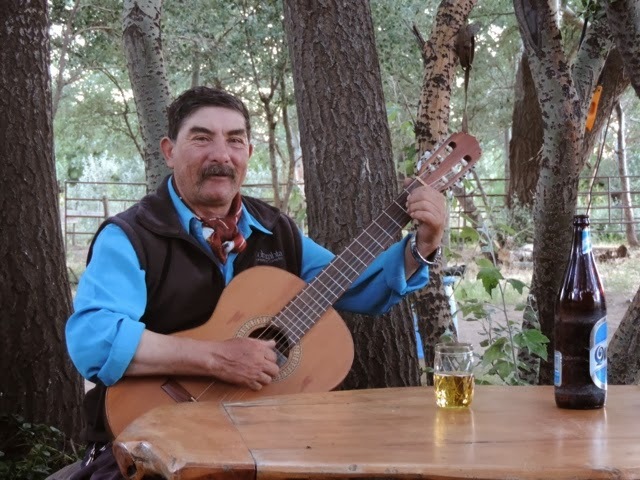 Jorge's friend decided to walk with me and sure enough at the back of the property there is a small building and he sells beer! Ice cold. 40 pesos for two large bottles. Things are looking up! 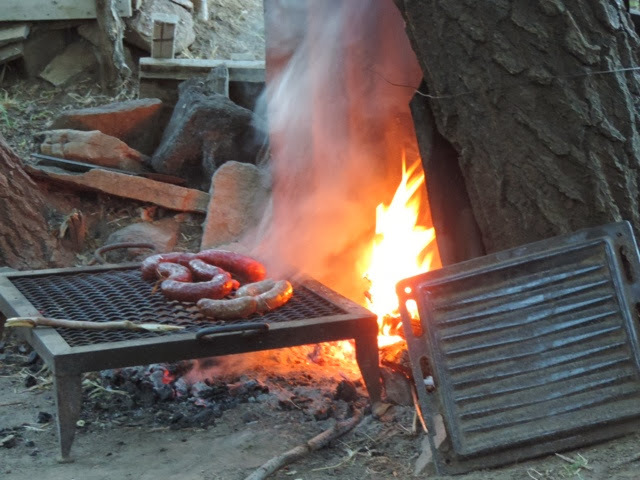 We head back to the ranch where Jorge has built a fire to roast chiazzo sausage which is our supper with bread and salad. Just like camping. The moon is out and the stars are plentiful! Jorge and Ginny went to a place called Buta Mallin today. It is supposed to be very beautiful with wonderful views. 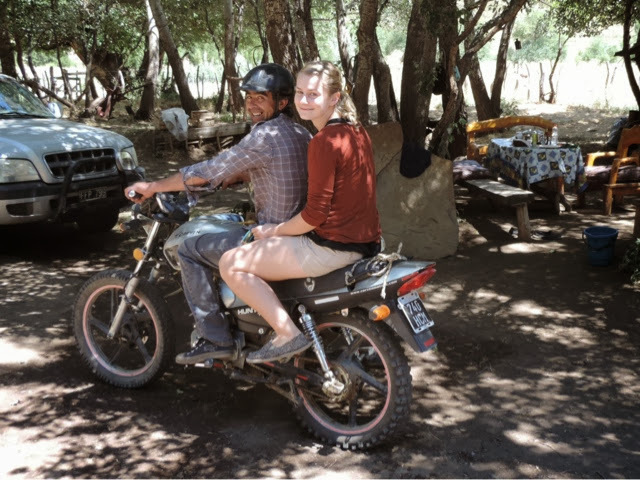 Jorge leaves tomorrow To go back to San Martin so they wanted to have a chance to spend the day there. I hope to go at another time. They have to take quite a few things so that the trip is comfortable for Ginny. While they were gone I pretty well had the place to myself so I just puttered around. I decided to clean some of the tack that was hanging around. 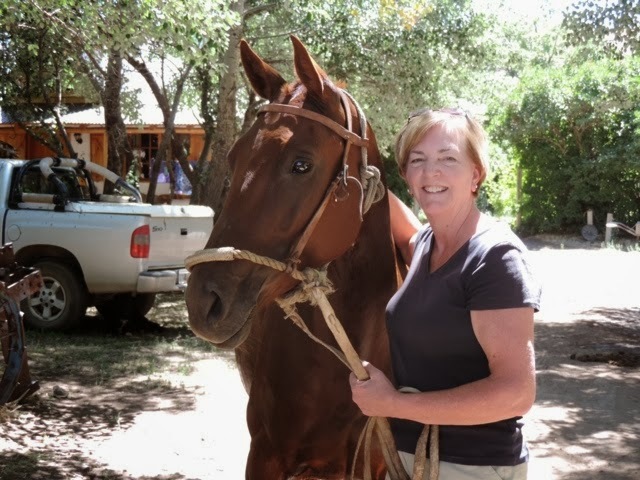 Brought back memories of when I had my horse. I'm just sitting in the shade on the porch.....it's really warm today and for once the strong winds have abated and there is just a gentle breeze which makes it perfect. 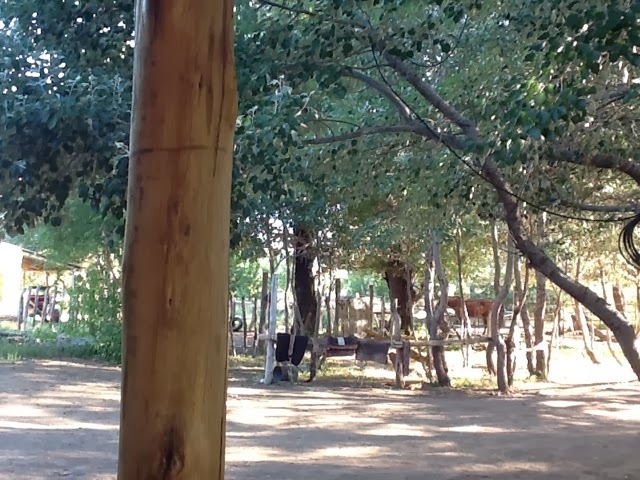 This is my view from the porch looking over at a couple of the corrals. I also enjoy 'shovelling manure' so I cleaned both these corrals today. Anything "horse". Loving the peace and quiet. No sirens here!